Rugby dates to the 19th century and though this sport is unconventional in its literal “backwards” nature, for centuries it has brought people together from different backgrounds. As a European alternative to the contact sport of American football, it attracts crowds and spectators at all levels. France is part of the Six Nations Rugby league, along with England, Italy, Ireland, Wales, and Scotland. It had the opportunity to send a women’s team and a men’s team to the 2016 Rio Olympics, where 7s Rugby (played with 7 people on each side) was introduced for the first time in Olympic history. A few notable French female players of color have made an impact on the rugby world as well as on the communities from which they come. The first is Julie Annery. Julie has played on France’s 7s team for Six Nations since 2016. Before then, she played for her hometown team, AC Bobigny 93 Rugby. In an interview with French radio station Outre-Mer 1ère, Julie spoke about her experience with rugby and how it is the perfect choice of sport to embody these proposed values. She also mentioned how in all her time playing rugby, she has never been faced with racism within the sport. Nor has she felt that being a woman has caused her more difficulty in the rugby world. The next notable player is Rose Thomas. 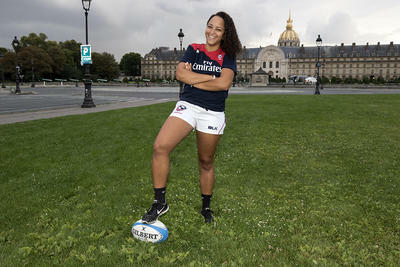 Rose was the only woman of color to compete for France on the Women’s Olympic 7s Rugby team last summer in Rio. She is a French-African rugby player of Central African descent. In a spotlight video on the Olympic Channel, Rose talks about how Central African culture was very much part of her growing up. She shares that her mother speaks to her in Sango, the official language of the Central African Republic, and that she always responds in French. She laughs about how when she visits the Central African Republic with her mother, they see her as “the little white girl” who is fully immersed in European culture and simply a visitor to her mother’s home country. 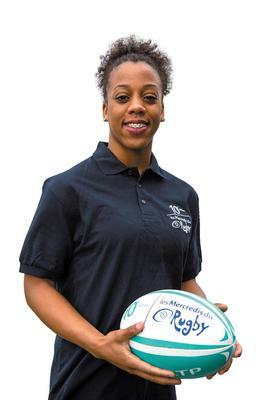 In regard to racism, Rose echoes the sentiments Julie Annery expressed, saying that she has never been faced with racism in her years as a rugby player. She also insightfully adds how racism is the fear of difference and how rugby helps foster integration because of the loyalty and camaraderie you feel towards someone when you are out on the field fighting for the people next to you. Julie Annery and Rose Thomas outline the values of rugby in a way that I identify very strongly with in my experience with playing rugby. I have never felt an ounce of racism within my rugby team and am proud to say that Stanford Women’s Rugby is one of the most diverse and supportive communities of strong women of which I’ve ever had the privilege to be a part. I’ve joined some pick-up rugby games while here in Paris and these groups of people have always been more than welcoming. Rugby truly is a sport that brings people together. Having played this sport for over two years, I can attest that rugby builds not only physical strength, but also mental strength. It gives you the power to fight the adversities you’ll face both on and off the field. Julie and Rose are exemplary role models of strength and discipline for young women of color throughout France and worldwide, both within the rugby sphere and outside of it.